Effect layer is useless by itself. To be able to use it, multiple sublayers need to be added to effect layer. Effect layer is a layer type to create delay animation effect. By using effect layer, you can delay animation between sublayers of effect layer. Each animation can have its own delay duration, so you can create an interesting animation by combining multiple keypaths with delay. Copy First Sublayer Attributes: All attribute changes to first of it’s sublayer will also applied to its siblings. 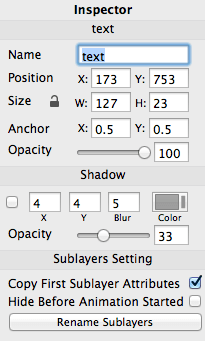 This make it easy for you to change all sublayers attribute at once. Hide Before Animation Started: In some case, you may want to hide effect layer’s sublayers before the animation started. Rename Sublayers: Quickly rename all sublayers name to numbered name. Additionally, you can quickly arrange the sublayers using Make Grid… and Arrange layers on path… both are available via Main Menu>Layer. To create delay effect, you need to add animation to effect layer. Animatable keypaths of effect layer is from its first sublayer. If other layer type is then added as sublayers to effect layer, unsupported keypath will do nothing. Two animation attributes at Keyframe Inspector that differentiate between effect layer and other layers are instance delay and instance order. Instance delay determines how much animation delay between each sublayer. Instance Order determines sublayers delay order.